One look at the name Spintires: MudRunner - American Wilds Edition and we wouldn’t blame you for assuming this was just another off-road racer. Something in the vein MXGP 3 or Monster Jam: Crush It!, perhaps. But you’d be wrong. This is no speed-obsessed demon, but rather an unusual take on the classic driving simulator more akin to Euro Truck Simulator 2 or Farming Simulator: Nintendo Switch Edition. Yes, we just used the word ‘simulator’ three times in the same sentence. Starting life out as Spintires - a niche project built from the ground up by Russian indie developer Pavel Zagrebelnyj - the series was picked up Focus Home Interactive and NBA 2K Playgrounds 2 developer Saber Interactive, which proceeded to add in tougher missions and more overall polish while maintaining the key elements that made the original so popular among its small yet dedicated player base – namely a hyper-realistic approach to vehicle physics and ground deformation. Now, we know on paper the idea of driving a truck along a muddy track, delivering logs from forest to lumber mill might sound dull, but that’s because you haven’t actually tried it. Spintires isn’t a glamorous experience, but it’s one that turns something as simple as navigating a slushy hole in the road into a tense and nail-biting experience. Honestly, we’re not even kidding. Your vehicle – there are 30 to collect and drive, ranging from pickup trucks to massive rigs – doesn’t slide about like a postman on black ice, but moves and reacts just like a real motor. Want to traverse a particularly rocky trail with your 4x4? Better take off your handbrake, enable all-wheel drive and lock your differentials so every wheel is turning together to stop your vehicle from tipping over and out of control. Driving a lorry and need to get up a muddy hill that’s turned into a bog? Better fire your winch and pull yourself up while steadily putting on the revs. It turns something as simple as escaping a puddle into an unexpectedly engrossing mixture of careful adjustment and gradual momentum. Take the game’s opening Challenge mode as a good example. 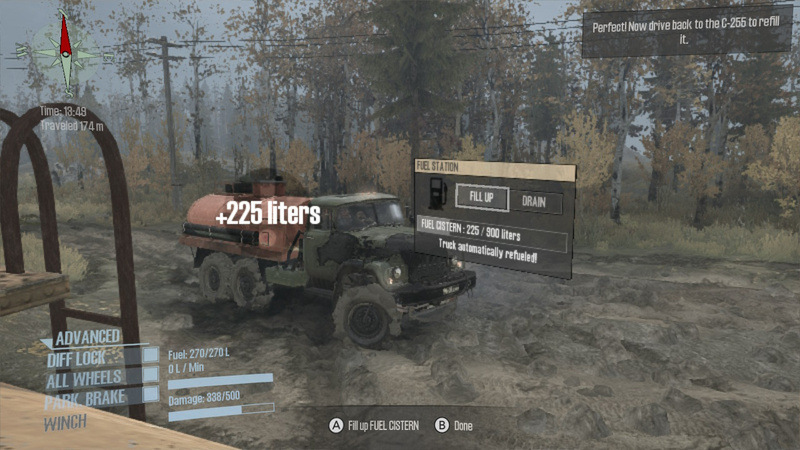 Once you clear Spintires’ simple tutorial, you’re coaxed into trying out a series of missions. It’s here you’ll get a good feel for the more open and freedom-rich world of the main game. 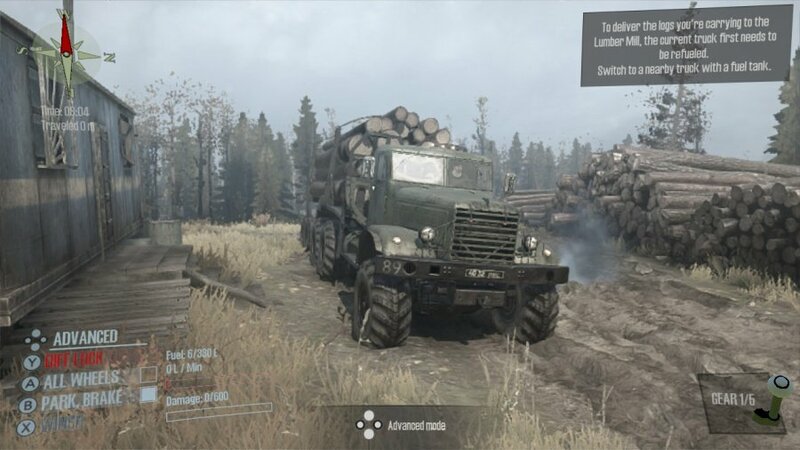 Rather than just driving around a series of locales in Russia and North America (the latter is DLC which is included with the main game), delivering logs and battling poor road maintenance, you’re given a specific task and a set of objectives to meet – or pitfalls to avoid. Known simply as ‘The Rig’, this seemingly simple affair requires you to drive a lorry rig to a nearby shack, attach a trailer and deliver said cargo to a location on the other side of the map. Each of the truncated locations in these challenges isn’t particularly large, but it’s the small obstacles that keep you keep occupied. Backing your rig up to the trailer is one, and attempting to pull your vehicle out of the bog with your winch is another. And let’s not get started on reversing the trailer into a designated area. It’s an experience that takes the easiest of tasks and makes it a battle with the laws of physics, but the elation you get when you finally traverse a pothole-filled road somehow gives you the incentive to try the next gauntlet. You can play in the main sandbox mode or in Challenges mode on your own in single-player, link up with a friend for some local co-op or form a team of log-carrying pros online. Much like Farming Simulator, Spintires’ multi-part operations really benefit from working as part of a like-minded squad. One player repairs vehicles, another refuels them while the rest focus on lifting logs with cranes and delivering them to a mill. The framerate occasionally drops when there’s four of you operating on-screen at once, but never to a significant degree. As a port, Spintires is impressively robust. The assets used to bring its Russian and American locations to life aren’t going to give The Witcher 3 any sleepless nights but that doesn't mean they aren't impressive in their own right. Water flows realistically. Trees bend and sway as you use them as anchor points for your winch and the ground deformation physics are really striking for a game running on Switch. Plus, all the vehicles have been rendered with bags of detail. Each one drives distinctly, and there’s a satisfaction to learning the capabilities and limitations of each one. Even driving around each map finding and unlocking vehicles has its charms, thanks to its slow and steady pace. There are some frustrating design issues, such as the inability to set a marker that automatically plots the best route to a given location. Instead, you’re forced to manually plot your journey like pins and thread on a map. It fits the methodical ethos of the game, but it’s the kind of busywork that could have so easily been solved by simply taking note of what open-world games have been doing for years. There's also no way to reset your vehicle when stuck – other than respawning at your garage – which does rankle a little after a long haul. 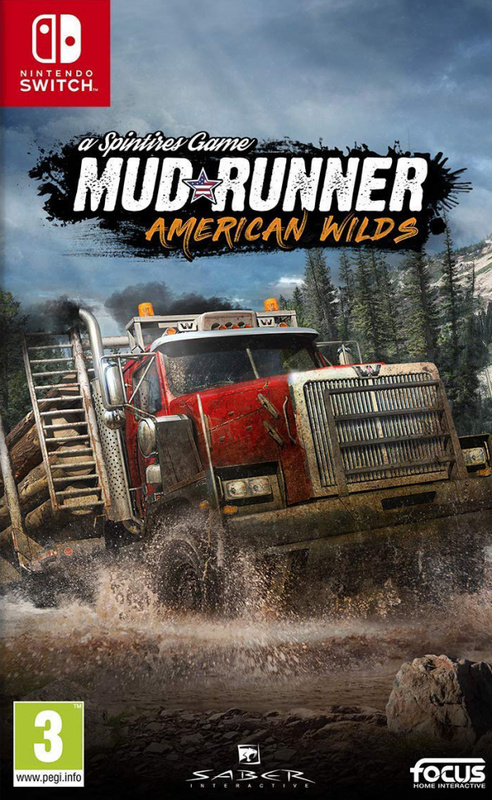 With Farming Simulator having no-showed Switch in 2018, it falls to Spintires: MudRunner - American Wilds to fill that very niche gap. While it’s still got some frustrating design faults that have carried over from the previous version, Saber Interactive has kept the core experience intact. The addition of the lush and verdant American wildness helps break up the dreary back roads of Russia, and whether you’re delivering logs on your own or fixing and refilling trucks in multiplayer, there’s a bizarre yet moreish satisfaction to be had. Now, when are we getting Euro Truck Simulator 2 on Switch? This actually seems pretty interesting to me - would consider at $10 or less. "Now, when are we getting Euro Truck Simulator 2 on Switch?" Sadly never, the dev said their directx9 engine is not compatible with current consoles. yeah. i'd drop a tenner on it. these games aren't bad really. they LOOK like they would be but honestly they are somewhat interesting. Not my kind of game in the slightest but it's nice to see developers trying something different. Looks interesting. Surprised the graphics are as nice as they appear to be. No, really not that surprising, that it can be addictive. Most of us still have that inner child that likes to play with cars and in the mud, so it's actually a rather good combination. And I've already been hooked on them ever since the first tech demo on PC. Far as I'm concerned, the game is easily worth an 8. Great graphics, very realistic physics and car/truck handling, and the vehicles themselves all have a very tough guy/meaty feel to them and are quite fun and entertaining to drive, provided of course, you're even remotely into this kind of thing. Besides the driving around and performing assignments, there's also tons of customization options, which some might also find interesting. 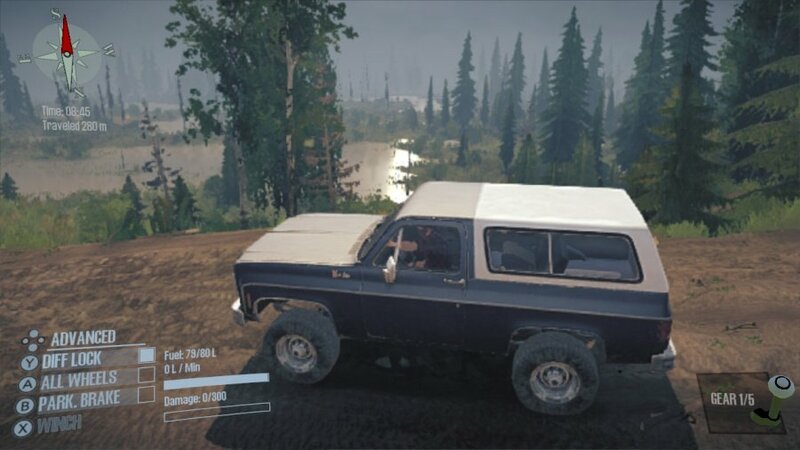 What's also really nice is that it's completely open world, so besides taking on assignments, you can literally drive everywhere that your vehicle or truck will take you. There's no invisible barriers preventing you from leaving the roads and so on, so you can make your own way across the various maps each time, which can really add to the replay value. Skip forward to see some of the various vehicles in action. Not completely on par with this latest version, but you can download the first freely playable tech demo of SpinTires on PC here or here, so that those who are interested or curious, can at least try it out. 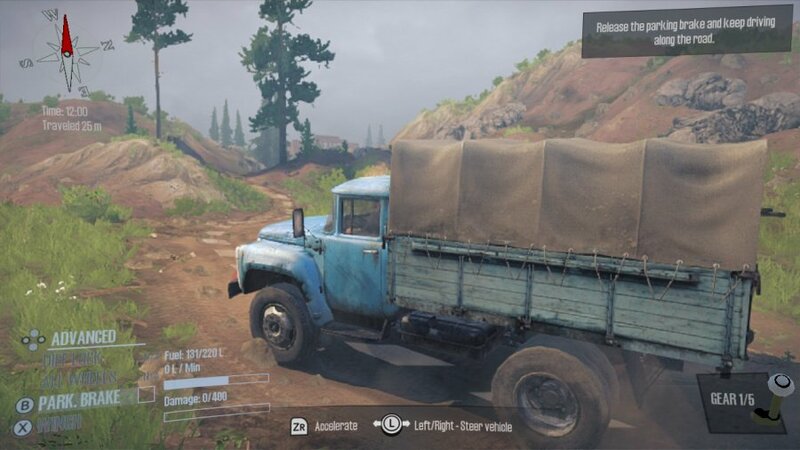 Mind you, all cars and trucks in the tech demo are Russian, probably due to the development team's origins, but the demo serves its purpose to at least give you a feel of the gameplay and car/truck handling. I saw the thumbnail and at first thought it was Big Rigs. Personally I'm loving this game. Forget Doom, this is the true "miracle port" on the Switch. CPU intensive simulation, vegetation everywhere... There is a real zenlike feeling to chugging your rig along at 10km/h, carefully maneuvering around every dip and puddle... At that speed you can fiddle with the camera on the right stick the whole time too. Then the trail you've been following crosses a raging river and you find yourself up to your windows in water, winching and re-winching just to make it 5m further forward... It's relaxing and satisfying and surprisingly beautiful in the graphics department too, although handheld takes a big hit to resolution. It's worth every cent and there's nothing else like it, especially on the Switch. I loved playing the original on my Xbox One, probably one of the most unique and fun yet challenging driving games I have ever played. The fact that they changed things up with this new release by making it based in America makes me want to purchase it. I think it is kinda expensive at $40 but it is great enough to be worth it. I can concur that this game is definitely addictive! I bought it physical and in my opinion you get a lot for 30 quid. It's not for everyone and definitely a niche game but I have not put it down since getting it (warframe is on the back seat for a while) . I would say it's part simulation (heavily simulated) and part strategy. For example: I took my jeep out for a scout looking for the best route to drive a truck up to the logging depot to collect said logs which is the crux of the game. After getting stuck and winching out of some rediculous deep bogs I found a short cut of sorts down what looked to be a flooded path. Easy I though, looks fine. Jeep innit? That will get through... 10 mins later after almost submerging it I rolled it. Ok that didn't work. Sent lorry out to same location to rescue jeep. Managed to get near enough to winch jeep out and then repair it to continue on... but then the truck runs out of fuel because I forgot to fill up the tanker on top before I set out! Honestly I have not had this much fun driving 1 mph in a forest full of mud in a long time. Graphics are great too and the physics engine that creates the mud and water , and the fact that everything is permanent - ahh there is my track I made earlier, follow the mud gouge- is quite an impressive feet to behold frankly. If you are on the fence I say buy. Don't let the price put you off. What is the throttle control mapped to in the Switch version? I think in a game like this that's trying to realistically simulate driving in very low traction conditions, throttle control would be a big part of the challenge. I'm curious, did they map throttle to one of the triggers, or to an analog stick? I have it and I love it. It's one children's and men's dream to play in the mud big time. It's so intense and satisfying, even being relaxing and zen-like. It's niche and not for everyone. But if you ever wanted to play a game that shows you how playing in mud should be delivered...the try this out. It‘s not often I start a game and have a big smile after a few minutes while playing. Analogue throttle would be helpful, but with stuttering digital throttle it is manageable. @bilboa Even on PC with an Xbox 360 controller, you don't really feel the difference with, or need, analog triggers. The game let's you alternate between normal drive and differential lock, and working with the different gear settings, which is manual stick shift. There's no real speed gain from depressing the analog triggers further. In that sense, it is indeed quite strategic like @b0nes said, instead of just being a driving sim. I'd say just try the demo that I linked to in comment #7 and find out for yourself. @TheFongz @ThanosReXXX Thanks. Maybe I'll give it a shot. Guess I was thinking of games like Dirt 3, which I've played on Xbox, where throttle control is a big part of the gameplay. I know you can make fun driving games without analog throttle control, it just seemed like a game like this one would benefit from it more than some. @bilboa I can understand people either expecting that or wondering about it, but you'll find you won't need it at all. But you should not compare it to racing sims, seeing as you'll hardly ever go faster than 15 - 20 kph max. It's rather all about plotting your course, diligence and mastery of your vehicle in all the different conditions. Throttle is mapped to triggers by default, by the way, but you can remap controls to your own liking. Well, at least: on PC and on the Xbox One, so I'd imagine the same options will be included in the Switch version. But try that demo, to get a good impression of the game, and then you'll find out soon enough if you like it or not. I have the original on PC and it's...not fun. But we get a ton of snow around here so maybe as a gaming experience it's just too close to real life than I'm comfortable with. Be warned: the physical cart has a mandatory download before you can play. I discovered this when trying to play offline. I was informed of an update as soon as I inserted the cart and got an error message when I tried to skip the download. There's no warning on the box. I'm a little disappointed. I was just looking at this in Gamestop. Looks very cool. Maybe a little too gearheady for me, but I'll keep it on the impulse/discount list. Just bought it. I can confirm that it looks about 90% as good as it did on the Xbox One, and it actually feels perfect on the Switch. Having a portable version of this game is just amazing, if I got this on the PS4 or Xbox I would probably be a bit disappointed considering the similarities to the previous game but everything about it seems perfectly suited for the Switch and a very worthwhile purchase on this platform. In racing sims the lack of analog triggers would be an issue but in this game you are usually just trying to manage your transmission and giving it full gas whenever you are accelerating. That and the graphics look fantastic as a Switch game, the environments are huge and have all kinds of deformation and the trucks are very well detailed showing off damage, mud, and all the ways they react to how they are being driven over the environment. Normally the lack of detail on the interior would bother me on the Xbox but on the Switch it feels just right. It honestly fills a niche I think the console desperately needed, and it isn't for everyone but if you are interested in mudding and trying to carefully get around a big open environment it is very satisfying. This is a 9/10 in my book, overall I am very impressed with the quality of this port, it is probably one of the best ports I have seen considering what it is like on other consoles. Those are some exquisitely modeled and textured trucks! Very juicy feel to the environment as well. I did not expect that. I had to look up Saber Interactive, and looking beyond NBA Playgrounds, they've made some very high-profile stuff. Crazy to see a truck simulator look this attractive, both in terms of visuals and game design. Wow, I was actually intending to pick this up on PS4 instead because I figured the Switch port would be, pardon the pun, 'bogged down'. This review actually changed my mind since my Switch is currently more accessible to me than my PS4 at the moment and I would love to support more ports like this. I was a huge fan of ETS2 and this is the closest thing we have to something like that so I was already interested to say the least. It would be cool if this did well enough for that upcoming PS4/XBOne truck sim 'Truck Driver' to also make the transition. I might even pick up my copy tomorrow, paycheck depending. I was expecting to see a 9 or even a 10 the way you were raving about it in the review. The 7 was a real shocker. Still, a great review. I'm actually excited to check this game out. I just ordered the physical version. This looks like a good simulation of actual off roading. I used to be able to do it in my Jeep. Slow and steady through thick mud and steep hills. I don’t know about anyone else, but I think this game might be pretty mucky. @Mountain_Man how big is the download? 1.7GB download, so it's not insignificant. It's just disappointing to have a game cartridge that will be effectively useless if Nintendo's servers ever go offline, or the download file gets pulled for whatever reason. That said, the game itself is really great. The graphics and physics engine is really well done, and the deformable terrain is amazing to see in action. Also, the challenges really are very challenging, especially if you try for the optional goals. The lack of an analog throttle is not a problem at all since you're mostly in low gear with your foot to the floor, just like real-life off-roading. This isn't a high-speed racer where you need to feather your throttle around corners. As one reviewer said, this isn't a game about miles per hour but inches. Just getting to the top of a muddy incline takes slow and steady finesse. @Mountain_Man Thanks. Also a consideration as I've run out of internal memory so will finally need to get an SD card. Or maybe I'll archive Hollow Knight as I just can't be arsed with it. I love Mudrunners on the PS4, its so relaxing to tool around in the wilderness in a giant truck. And, I know I’m weird for this, but it has the best sounding mud I’ve heard in a game. I’ll definitely be getting this on the Switch too! Played this on PC, Not one of the best, but is different. The comment of Euro Truck Simulator 2 definitely gets my approval. Have that and American Truck Simulator on Steam. Having those on a Switch would be amazing. Especially if was cross platform linked so you can continue on PC/Switch respectively.